This stunning space wallpaper shows the view of the sun from the SWAP (Sun Watcher using Active Pixel System detector and Image Processing) instrument onboard ESA's Proba-2 satellite. This stunning space wallpaper shows the view of the sun from the SWAP (Sun Watcher using Active Pixel System detector and Image Processing) instrument onboard ESA's Proba-2 satellite. SWAP is a small telescope that captures the solar corona at wavelengths corresponding to temperatures of about a million degrees (around 17.1 nanometers). 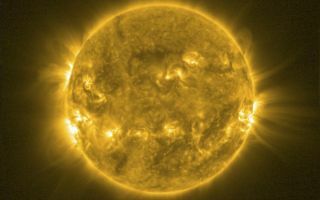 SWAP images are used to study the origin of solar phenomena, including solar flares and coronal mass ejections — massive eruptions of material into interplanetary space. Both are important sources of space weather, which profoundly affects the environmental conditions in Earth’s magnetosphere, ionosphere and thermosphere. This image was released July 30, 3013.